My work nightmares are a little more subtle. I’ll be working hard, getting stuff done and look up at the clock to see I only have 2 hours left. After I do a bunch more work I’ll look up and see I have 3 hours left! In my frustration I will go over to a coworkers desk to complain but nobody is there. In fact I’m the only one at the office because it’s Saturday and I’m not supposed to even be there. My “work” nightmares are in fact school nightmares, as I’ve never had another “job” so far than just going to school, if that counts as a job. I’ve had several dreams where I’ve had to return to the school I went to as a little kid, and even though this probably doesn’t sound like a nightmare to most other people, it’s still a terrifying thought for me. Well, I once had a dream where I was afraid of being late for school and desperately tried to wake myself up, but that wasn’t too scary. There was a worse one where I came home from school at 9 AM the next day. But the one in which the scary thing was exclusively school-related was also one about returning to the first school I went to. I was there with my friends, lying on the carpet, eating chips and enjoying the sweet memories (some of which were fake)… And then I was in the Physics classroom from the school where I went at that current time, and I was supposed to do some very hard calculations. I’ve continually had dreams like that, including dreams where I just can’t seem to get to my next class on time, and when I do arrive, I’ve somehow lost some or all of my clothes! Very disturbing, actually. 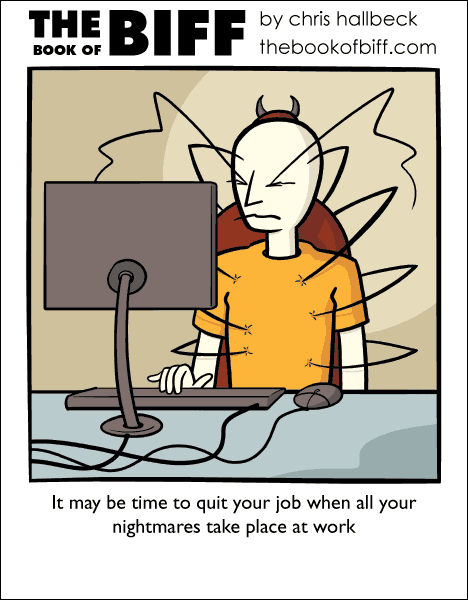 “when you dream your nightmares are work-related” or is it “when you get to work your nightmares become reality there”? I think you can interpret it both ways. I am the only employee, the gallery being that small, so I really don’t have no one to talk to, except the art. None of it has talked back, yet, so I’m relatively sane. So far. I want that chair. I mean it’s great, one leg can hold your cup of tea, another leg can catch and kill that fly that ALWAYS bothers you, one can hold your purse and you KNOW no one is going to mess with it. Provided that the chair is well fed and in a good mood, of course. If it ever starts getting sassy, just plunk a can of Raid down on the desk as a passive-aggressive notice.